Cozoy is a Hong Kong outfit which was founded in 2014 on the back of a simple vision – to strive for ultimate sonic reproduction and functionality and on that basis, product designs are crafted with selected metals and components, fusing leading innovations on circuitry and implementations of cutting-edge metal processing techniques. 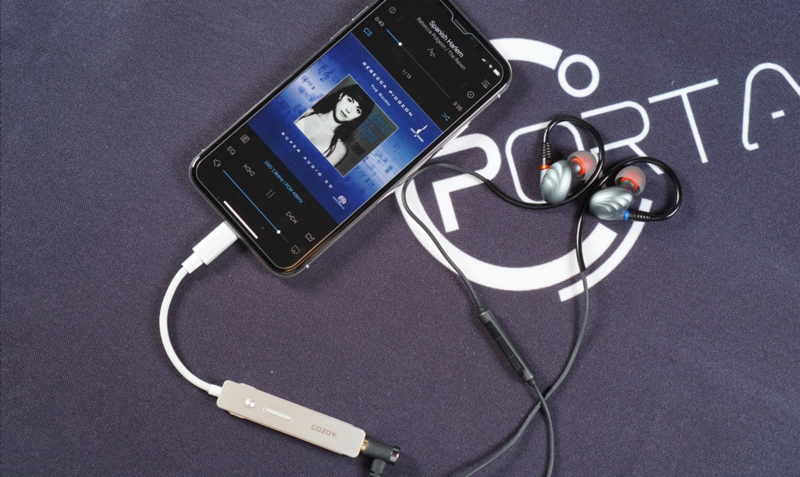 Cozoy’s current product lines include portable Digital to Analogue Converter (DAC) and In-Ear Monitors (IEM). In the second of a three-part review series on entry-level portable DAC/Amplifier (DAC/Amp), we will be looking at Cozoy TAKT. For those of you who missed the first of the series, where we reviewed the FiiO Q1 Mark 2, you can find it here. 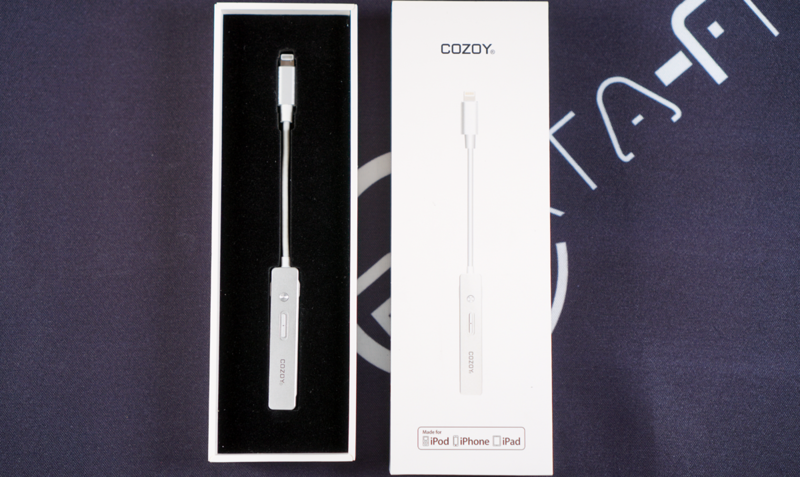 Like the FiiO Q1 Mark 2, the Cozoy TAKT is MFi certified and features a non-detachable Lightning connector effectively a direct replacement for Apple’s Lightning to 3.5mm headphone jack adapter. While this allows one to connect directly with iOS devices bypassing the need of the Apple Camera Connection Kit (CCK), it also meant that TAKT will only work with iOS devices with Lightning ports. The Cozoy TAKT weighs in at just about 11g with dimensions measuring 65mm (L) x 11mm (W) x 6mm (H). The use of an alloy of aluminium and magnesium, coupled with rounded edges provides a positive representation of the company’s vision and design philosophies. The TAKT features a single 3.5mm single-ended output, a volume rocker and a multi-functional click-button featuring play/pause on a single-click, next track on a double-click, the previous track on a triple-click for playback and for telephony, call pickup/end on a single-click and hold to activate Siri. TAKT also supports earphones with line-control remote functions. Cozoy implemented a Cirrus Logic CS42L42 chipset in TAKT with the ability to decode audio formats of up to 384 kHz/32-bit resolution PCM, as well as native DSD decoding of up to DSD128, however, due to the use of Apple’s LAM (Lightning Adaptor Module) based on MFi design requirement ensured that TAKT can only deliver 48kHz/24-bit resolution due to the LAM upstream limitation. The TAKT does not feature a built-in battery and draws its power directly from the source device. During the review process, it is observed that the TAKT tends to draw more power than Apple’s Lightning to 3.5mm headphone jack adapter, especially when playing DSD files, however not significant enough to cause a concern to the battery life of the source device. Rated at 28mW@32Ω on the 3.5mm single-ended output, the output power is slightly lower than that of iPhone’s original output of 31mW@32Ω, not surprising as the Cirrus Logic CS42L42 DAC chipset did not feature an amplifier chip. However, what this means is that if you are using any earphones which are challenging to power on the iPhone X, you are unlikely to gain any headway with the TAKT. The TAKT has a Signal to Noise Ratio (SNR) of 114dB compared to the iPhone X’s 102dB, theoretically translating that the TAKT would have a darker background with lower distortion. The biggest difference, however, is the stereo crosstalk, with the iPhone X registering -85dB against the TAKT’s -102dB. The lower stereo crosstalk theoretically depicts that the TAKT will exhibit better sound staging made possible by better sound imaging and sound separation. Plugging in the FiiO F9 Pro In-Ear Monitors (IEM), I opted for the 3.5mm single-ended cable with the in-line control which allows me to test out TAKT’s supports for earphones with line-control remote functions. TAKT supports the in-line control on the FiiO F9 Pro, reaffirming its compatibility for products adopting Apple’s in-line control functions. The TAKT features a sound signature similar to that of the Apple’s Lightning to 3.5mm headphone jack adapter, but not without distinctive differences, the TAKT does exhibit a higher resolution, better sound staging and a darker background. The TAKT has a low-end that is reasonable with hardly any sub-bass extensions but lacking in tightness and depth. Though unimpressive, one could still enjoy the low-end due to its coherence, clarity and linearity, I would have preferred it to have more depth and decay. The midrange on the TAKT exhibits good separation across the spectrum allowing for vocals to come through naturally with reasonable resolution and coherence. The TAKT does present a more rounded vocal compared to the adapter from Apple. Treble is not lacking quantitatively with crisp details at the lower-treble, however, lacking qualitatively particularly in sparkle and treble extensions. 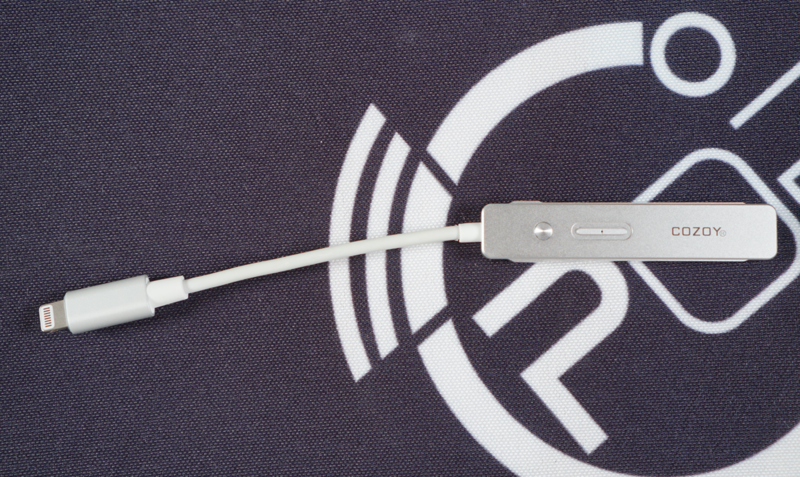 Overall, the TAKT does sound distinctively better than Apple’s Lightning to 3.5mm headphone jack adapter, attributable to its more rounded midrange, clarity and coherence across the spectrum as well as better sound staging made possible by better sound imaging and sound separation due to its lower stereo crosstalk. The Cozoy TAKT enhances the listening experience of the iOS device while maintaining the sound signature which iOS device users are accustomed to with added clarity and better sound staging. For the jack-less iOS device users, the TAKT's flexible and light-weighted form factor allows one to use it as a competent direct replacement for Apple’s Lightning to 3.5mm headphone jack adapter with the added ability to support DSD playback. At USD 150, the TAKT is a pricey compared to similar offerings on the market.